Join us! Sign up on our main page to take part in any of the four planks of the Riders’ Transit Vision: Transit as A Roadmap for Economic Opportunity, A Foundation for Equity, A Solution for Air Quality and Climate Change, and A Vital Link for Quality, Affordable Housing. Pittsburghers for Public Transit is worked closely with Casa San Jose, the Alliance for Police Accountability, and the Thomas Merton Center to oppose the Port Authority’s proposed proof of payment plan, which includes armed police checking for fare payment on the T. After more than a year of rallies, testimony, petitions, postcards, and marches, the Port Authority CEO Katherine Kelleman announced in April 2018 that the Port Authority would not proceed with having armed police officers check fares on transit. This was a huge victory, and prevented the harm that we’ve seen in other cities with similar policies across the country, including the detainment and deportation of undocumented immigrants, the criminalization of the poor, the worsening of the school to prison pipeline, and police brutality on our black and brown residents on public transit. We are continuing to advocate for safer and better transit police practices, with demands that include a policy of non-compliance with ICE, better training in mental health intervention, racial bias, diverse hiring and promotions, and a civilian oversight board. We are also connecting with refugee and other marginalized communities to discuss ways the the Port Authority can be more accessible to all our county residents. We want a Pittsburgh for all. We believe in a city that is inclusive, a city that is one of opportunity for people of all backgrounds, a city that is accountable to its people, and a city that is equitable. Amazon HQ2 in Pittsburgh would be a catastrophe — it would cause a housing crisis like no one has ever seen in Pittsburgh, leading to thousands of people and families being displaced. The day that the HQ2 decision is made will catalyze a frenzy of housing speculation by investors on vacant and occupied homes across Pittsburgh, as we now see both in Seattle and in East Liberty, where speculation on housing has driven out long term residents because of a couple hundred tech jobs. It would mean a redirection of our resources and money to serve the needs of wealthy, mostly white high tech workers relocating to the city, and the tax breaks and incentives being offered would mean a deterioration of public education and other vital public services. Check out our campaign page and FAQ for Amazon HQ2 here. Housing and transit go hand in hand. The housing crisis in Pittsburgh is pushing more and more residents, particularly low income and black and brown residents, out of the city into transit deserts. The isolation of being in far-flung communities without any means to transport adds to the trauma of displacement and is unacceptable. 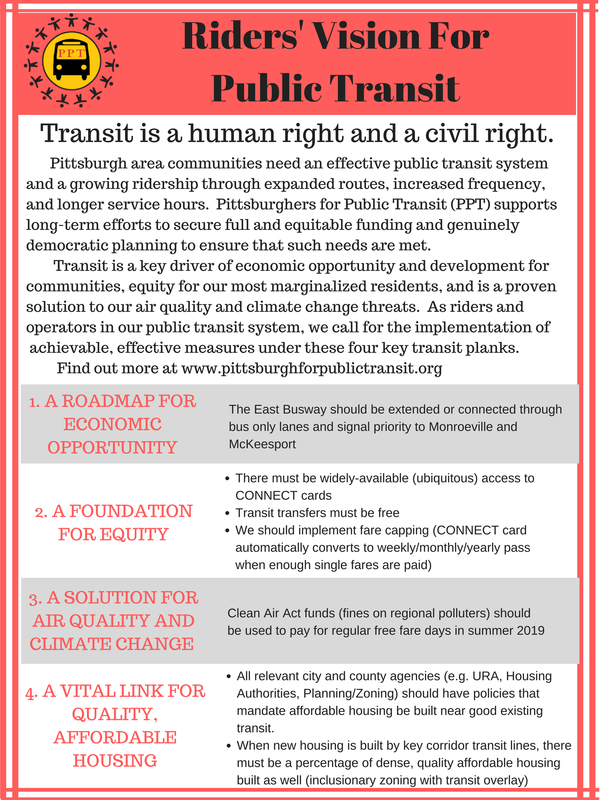 Pittsburghers for Public Transit is working to push the Port Authority of Allegheny County and the City to adopt policies to prevent displacement, including mandatory inclusionary zoning, and particular emphasis on affordable housing around transit-oriented development (TOD) sites.